Objective To assess the efficacy of active treatment targeted at underlying disease (TTD)/potentially curative treatments versus palliative care (PC) in improving overall survival (OS) in terminally ill patients. Design We performed a systematic review and meta-analysis of randomised controlled trials (RCT). Methodological quality of included RCTs was assessed using the Cochrane risk of bias tool. Data sources Medline and Cochrane databases were searched, with no language restriction, from inception to 19 October 2016. Eligibility criteria for selecting studies Any RCT assessing the efficacy of any active TTD versus PC in adult patients with terminal illness with a prognosis of <6-month survival were eligible for inclusion. Results Initial search identified 8252 citations of which 10 RCTs (15 comparisons, 1549 patients) met inclusion criteria. All RCTs included patients with cancer. OS was reported in 7 RCTs (8 comparisons, 1158 patients). The pooled results showed no statistically significant difference in OS between TTD and PC (HR (95% CI) 0.85 (0.71 to 1.02)). The heterogeneity between pooled studies was high (I2=62.1%). Overall rates of adverse events were higher in the TTD arm. Conclusions Our systematic review of available RCTs in patients with terminal illness due to cancer shows that TTD compared with PC did not demonstrably impact OS and is associated with increased toxicity. The results provide assurance to physicians, patients and family that the patients' survival will not be compromised by referral to hospice with focus on PC. 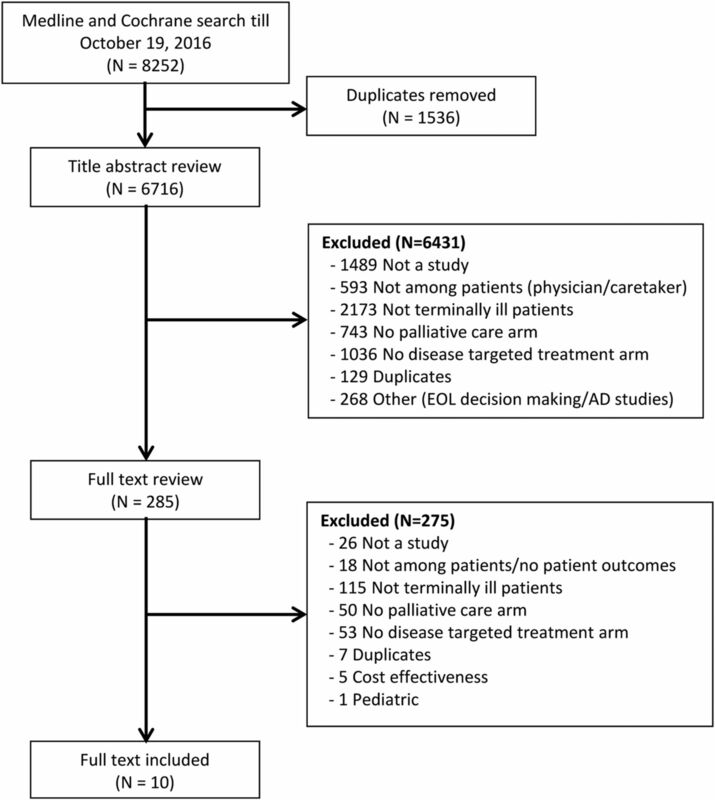 This is the first systematic review of randomised controlled trials to assess the benefits and risks associated with active treatment targeted at underlying disease versus palliative in the end-of-life setting. One of the strengths of this study was the extensive, systematic literature search performed to identify all available randomised controlled trials in terminally ill patients. A limitation of this systematic review is the availability of small number of studies with overall survival data. Given that physicians are not accurate in establishing patients' prognosis for course of disease or death,14 ,15 to make informed choice, patients and physicians alike need reliable evidence on benefits and risks associated with TTD versus PC. Accordingly, we performed a systematic review with a goal to synthesise all available evidence to reliably assess the efficacy and safety of TTD compared with PC in patients with terminal illness (with expected survival of <6 months). Any RCT enrolling patients with clearly stated predicted median survival of <6 months comparing an established TTD versus PC alone was eligible for inclusion. Studies of novel TTD treatments within a context of clinical trials were excluded. We also excluded trials comparing add-on PC to two active treatments. The distinction between PC versus TTD was made based on the original investigators intent (ie, symptom management vs curative or life prolonging intent) as stated in the introduction or methods of included studies. A comprehensive search of Medline and Cochrane electronic databases, with no language restriction, was undertaken from inception to 19 October 2016. Search strategy is provided in online supplementary appendix 1. Two authors (AK and TR) reviewed all retrieved titles/abstracts and full-text articles independently. A third author (BD) reviewed any disagreements to arrive at consensus. When appropriate, data were pooled for each outcome. Dichotomous data were summarised using risk ratio (RR) based on the number of events and total number of participants and pooled under random-effects model. In regards to time-to-event data, HR and 95% CIs were extracted, whenever reported. Otherwise, total number of participants and events per arm and the p value were obtained in order to calculate the observed minus expected value (O-E) and variance as per method by Tierney et al.19 Time-to-event data were pooled using generic inverse variance under the random-effects model. All data are reported with 95% CI. Calculation of the I2 statistic was used to assess for heterogeneity. An I2 <30% was considered low heterogeneity, between 30% and 50% moderate heterogeneity and over 50% high heterogeneity.20 The analyses were performed using Review Manager software (Review Manager (RevMan) [program]. Version 5.3 version. Copenhagen: The Nordic Cochrane Centre, The Cochrane Collaboration, 2014). The initial search identified 8252 articles of which 10 RCTs (15 comparisons, 1549 patients) met the inclusion criteria.11–13 ,21–27 The study selection process is illustrated in figure 1. Flow diagram depicting the identification and selection of eligible studies for inclusion in the systematic review and meta-analysis. The overall methodological quality of included studies ranged from moderate to low. 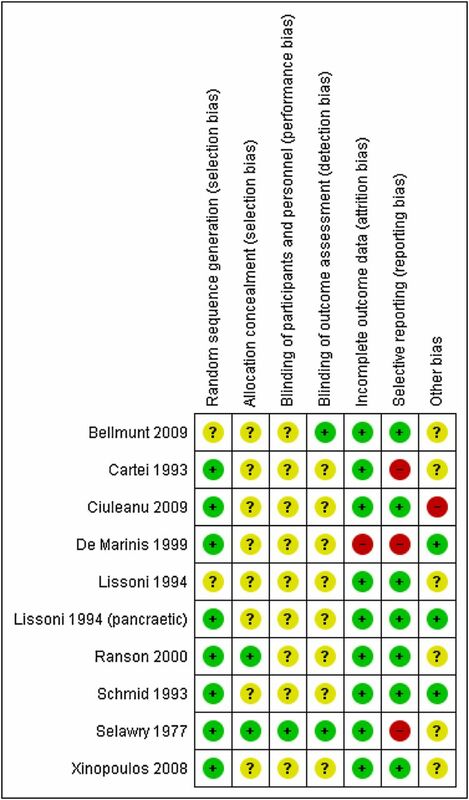 As shown in figure 2, 80% of included studies (8/10) reported method of randomisation sequence generation. However, only 20% (2/10) of included studies were judged to have adequate allocation concealment and only 10% (1/10) involved blinding of participants/personnel or outcome assessors. Ninety per cent of studies (9/10) performed analysis as per intention-to-treat principle and 70% (7/10) studies reported all outcomes and did not involve selective reporting of outcomes. Patient outcomes are summarised in table 2. Figure 3 shows a forest plot comparing effects of TTD versus PC on the OS. OS was reported by seven RCTs (eight comparisons, 1158 patients).11–13 ,23–25 ,27 The pooled results showed no statistically significant difference in OS between TTD and PC (HR (95% CI) 0.85 (0.71 to 1.02)). The heterogeneity between pooled studies was high (I2=62.1%). Four studies included QOL as an outcome; however, data were not extractable for pooling.11 ,23 ,24 ,27 Only two RCTs (668 patients) reported TRM.11 ,25 There was no statistically significant difference in TRM between TTD and PC (RR (95% CI) 0.92 (0.31 to 2.76)). There was no heterogeneity between pooled studies (I2=0%). Seven RCTs (10 comparisons)11 ,13 ,22–26 discussed adverse events but only three (three comparisons)11 ,23 ,25 reported comparative data for both study arms. Overall, grade three or four adverse events were significantly more common on the TTD arm compared with PC (see table 2). Forest plot for overall survival. The summary estimate (HR) from individual studies is indicated by rectangles with lines representing the 95% CIs. The summary pooled estimate from all studies is represented by the diamond and the stretch of the diamond indicates the corresponding 95% CI. Summary estimates that fall to the left of the line (HR<1) indicate favourable survival on the treatment targeted at underlying disease (TTD) arm. Summary estimates that fall to the right of the line (HR>1) indicate favourable survival on the palliative care (PC) arm. The findings of this systematic review have several important implications for physicians, patients and policymakers. Physicians are obligated legally and ethically to provide patients with evidence on alternative management options in the end-of-life setting. Some states such as New York and California make the failure to discuss the management alternatives in terminal setting punishable by law (up to $5000 for repeated offences, and wilful violations by a jail term of up to 1 year).28 However, repeated assessments of the quality of decision-making in the end-of-life setting over the last two decades continue to show that is inadequate.1 In 2014, 55 million people died worldwide, the vast majority of whom did not receive adequate end-of-life care.29 The fundamental reason for this state of affairs is the lack of reliable estimates about the efficacy and safety of active treatment (TTD) versus PC in patients in terminal phase of their lives. Even though it is known that PC does improve survival when it is added to TTD,30 it is not known if TTD is superior to PC alone. Our systematic review fills this void. To the best of our knowledge, this is the first systematic review assessing the role of TTD compared with PC in patients with terminal illness with expected survival of <6 months. The findings showed that overall TTD compared with PC does not improve survival and is associated with significantly higher incidence of fatigue, nausea/vomiting, mucositis, grade III/IV neuropathy, anaemia, leukopenia, neutropaenia, and myalgia leading to poor QOL. Our study has several limitations, mainly due to selective outcome reporting and methodological quality of the primary studies eligible for this analysis. For example, of the 10 RCTs that met the inclusion criteria only 7 (eight comparisons) reported survival as an outcome, which is surprising, given that life expectancy is the most important outcome for patients with terminal illness.37 Additionally, QOL was also measured and reported in only 4 of the 10 studies; these studies used different QOL measures making comparisons more difficult. However, despite selective reporting in individual studies, these findings represent the totality of the currently available evidence. The overall methodological quality of included studies ranged from moderate to low, which can be attributed to lack of allocation concealment and blinding. Whether, the lack of allocation concealment is an artefact of reporting or conduct38 could not be determined since study protocols were not available. Regarding the lack of blinding, we believe this issue is not a major concern because survival was the main outcome for our study; mortality is an objective outcome and blinding is important in cases where the outcome is subjective. In summary, our systematic review of available RCTs in patients with terminal illness shows that TTD compared with PC does not impact survival and is associated with increased toxicity. The results provide assurance to physicians, patients, and family that the patients with estimated survival of <6 months would be better off by referral to hospice. Whether new drugs with potentially life prolonging potential and safer toxicity profile will challenge these findings can only be determined in future well designed RCTs with adequate power. The average sample size in included studies was 124, which provides 15% power to detect a 15% survival difference (HR of 0.85 observed in this meta-analysis). To detect a 15% survival difference with 80% power and a 0.05 level of significance, a sample size of 1194 patients is needed. In the mean time, the physicians should be judicious in actively treating patients whose estimated survival is <6 months and provide information on benefits and risks associated with TTD versus PC to facilitate shared decision-making. Institute of Medicine. Dying in America: improving quality and honoring individual preferences near the end of life. Washington DC: The National Academies Press, 2015.
. Cancer chemotherapy near the end of life: the time has come to set guidelines for its appropriate use. Tumori 2007;93:417–22.
. Chapter 8: assessing risk of bias in included studies. Cochrane Handbook for Systematic Reviews of Interventions. 2011.
. The role of vindesine and lonidamine in the treatment of elderly patients with advanced non-small cell lung cancer: a phase III randomized FONICAP trial. Italian Lung Cancer Task Force. Tumori 1999;85:177–82.
. Gemcitabine as palliative treatment in patients with unresectable pancreatic cancer previously treated with placement of a covered metal stent. A randomized controlled trial. J BUON 2008;13:341–7.
. A clinical-study of immunotherapy versus endocrine therapy versus chemotherapy in the treatment of advanced pancreatic adenocarcinoma. Oncol Rep 1994;1:1277–80.
. Epistemologic inquiries in evidence-based medicine. Cancer Control 2009;16:158–68.
. Quality of end-of-life cancer care for Medicare beneficiaries: regional and hospital-specific analyses. In: Boronner KK, ed. Washington DC: The Dartmouth Institute for Health Policy & Clinical Prectice, 2010.
. Terminally ill cancer patients. Their most important concerns. Cancer Pract 1997;5:147–54. Contributors TR, AK and BD contributed to the study concept and design. TR, AK and FAK performed the data abstraction, analysis and interpretation. TR and AK participated in the drafting of the manuscript. TR, AK, FAK and BD performed the critical revision of the manuscript for important intellectual content. TR performed the statistical analysis. BD obtained funding. “TR and FAK were responsible for procurement of full text of all articles for data abstraction, printing of data abstraction forms and entering of data for analysis.” AK and BD were involved in the study supervision. TR, AK, FAK and BD approved final version of the manuscript for submission. Funding This work was supported by Department of Defense (grant number W81-XWH-09-2-0175) (PI: Djulbegovic). Disclaimer The funding agency did not play a role in the design and conduct of the study; collection, management, analysis, and interpretation of the data; preparation, review, or approval of the manuscript; and decision to submit the manuscript for publication. The researchers worked independently of the funding agency for this systematic review.